Take Action! Send Alicia Keys Your BDS Photos! Alicia Keys is set to perform in Tel Aviv on July 4 as part of her Set the World on Fire tour. Both Alice Walker and Roger Waters have written her open letters (here and here) urging her to heed the Palestinian BDS call and cancel her show. You can do your part by taking the following actions! 1. Submit a photo. Alicia is running a competition for her fans to get featured in a video that will be shown while she is on tour. Fans are asked to submit a photo with the hope of being chosen. This is an opportunity for some culture jamming asking activists to submit pictures with messages urging her to not play in Israel. 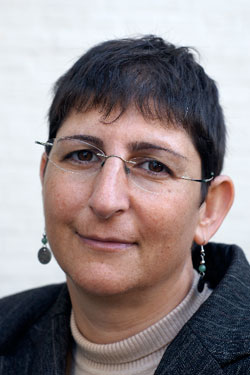 Go to her website: http://ow.ly/ly08A. Scroll down to the interactive map and click "Get Started." Yellow pins show cities that are open for photo submissions. None of these cities are in the United States, but that is ok because it doesn't matter if you're really from the city you're submitting from. Click on a city. Enter "Boycott Apartheid" in the box that asks for one word to describe the city, then your name and email. Upload a photo then hit submit! Send in pictures/infographics of examples of Israeli occupation and apartheid (the wall, house demolitions, checkpoints, etc); Palestinian popular resistance; and/or of yourself holding signs of solidarity with Palestinians. Share with us the pictures you upload via our Tumblr or email to membership@endtheoccupation.org. 2. Watch and share this video via Facebook. 3. Tweet the following to Alicia Keys (@aliciakeys). Take Action! SodaStream At Cannes! 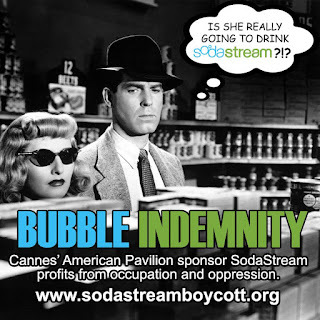 The American Pavilion at the Cannes Film Festival, which opens today, is featuring SodaStream as its premier sponsor. We need your help to pressure them about shining the spotlight on this occupation profiteer! 1. 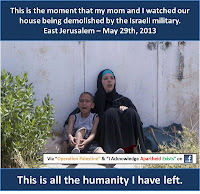 Watch and share this great video made my member group Jewish Voice for Peace- DC Metro. 2. 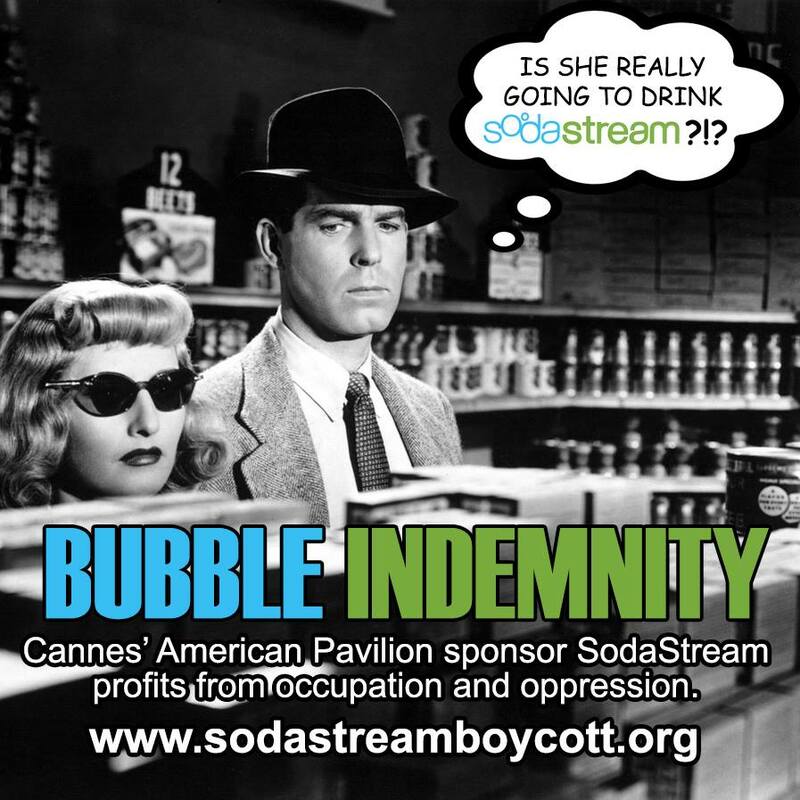 Read our press release "International Coalition Criticizes SodaStream Sponsorship of the American Pavilion at Cannes Film Festival." 3. Tweet! Below are sample tweets from our member group The Palestine Freedom Project. 4. Share this image with your Facebook friends by clicking here. 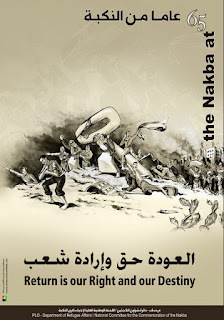 These events are being held to mark 65 years since the Nakba, the dispossession and forced exile of hundreds of thousands of Palestinians from their land before and during the creation of the State of Israel in 1948. If you would like your event added, please email membership@endtheoccupation.org. A radio play about a series of meetings by Zionist leaders to plan the ethnic cleansing of Palestine, 1947-48. All quotes from Israeli historian Ilan Pappe’s book The Ethnic Cleansing of Palestine. 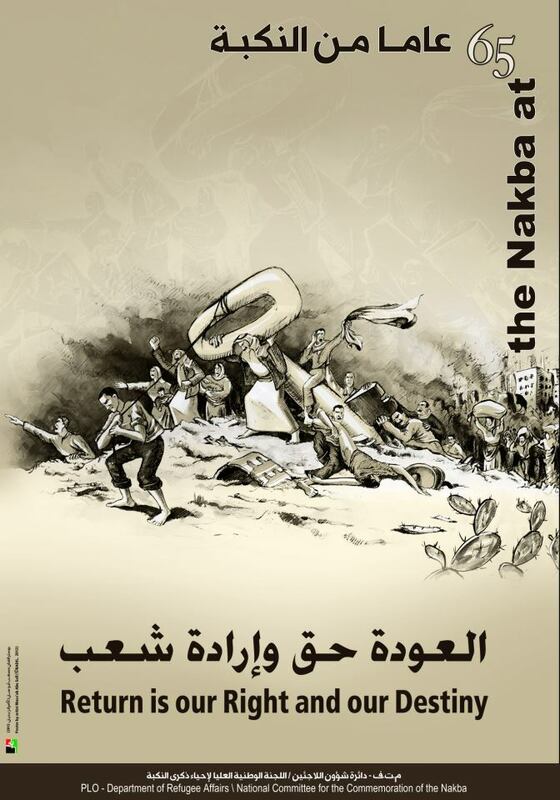 Check out US Campaign member group SeaMAC's growing ad campaign in the Seattle area calling for equal rights for Palestinians, along with its commemoration of the Nakba. Seattle Mideast Awareness Campaign (SeaMAC) has started running its bus ad campaign EQUAL RIGHTS FOR PALESTINIANS: THE WAY TO PEACE in Bellevue, Redmond, and Kirkland this week. Those ads began on May 1 and will run on six buses for four weeks, along with ads on six buses in Seattle at the same time. The Equal Rights ads are also running on buses in Port Angeles and Clallam County, and have appeared in buses and newspapers in Tacoma and Olympia. Photos available on request; also at www.SeaMAC.org. In his book The Ethnic Cleansing of Palestine, Israeli historian Ilan Pappe has described the events of 1947-9 as "a crime against humanity that Israel has wanted to deny and cause the world to forget." Pappe also observes that Palestinians in the West Bank and Greater Jerusalem are undergoing ethnic cleansing today, as Israel continues to drive them out to make room for more Israeli settlers. PALESTINE: STOLEN HOMELAND is organized by Palestine Solidarity Committee, Voices of Palestine, and Seattle Mideast Awareness Campaign. To observe Mothers Day -- originally an anti-war holiday -- PALESTINE: STOLEN HOMELAND will also include a booth for MOTHERS AGAINST ETHNIC CLEANSING. 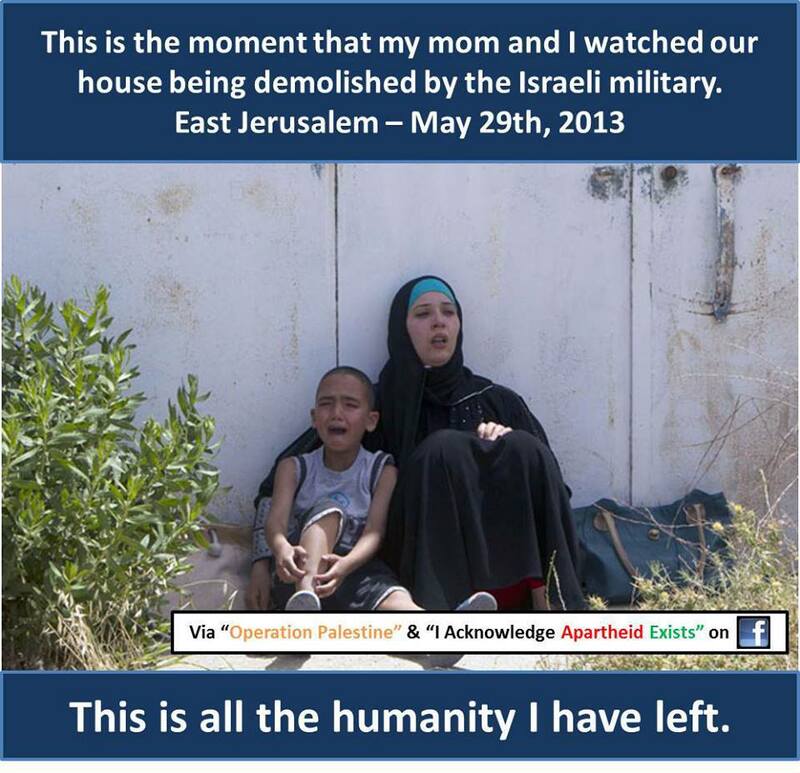 For more information about Palestine: Stolen Homeland, contact info@palestineinformation.org. New Billboard and Web Site say unconditional aid to Israel deterrent to peace, harmful to both U.S. and Israel. Endorsements arrive. Where: Billboard is located on Fuller Road, between Cherry Street and Dorlyn Road, visible when travelling on Fuller from Central Avenue toward Washington Avenue. How: Billboard is funded by donations. Why: Because unconditional aid to Israel siphons funds from domestic use, and supports hard-line Israeli factions, thwarting a just peace. "By placing a billboard in Albany calling on the United States to end $30 billion of taxpayer-financed weapons to Israel, Stop $30 Billion--New York State is providing a valuable resource to people in New York, educating them about how our tax dollars could be better spent on unmet community needs rather than on enabling Israel's oppression of Palestinians." “Sending $30,000,000,000 of our money as military aid to a country with the 10th most powerful military in the world may seem like a good idea to politicians looking for campaign contributions from members of the American Israel Public Affairs Committee. But to Americans who are struggling to feed their families here at home or who care about health crises in less developed countries, it sends a message of indifference towards people who are in genuine need of help. Addameer Prisoner Support and Human Rights Association, a Palestinian NGO providing legal and advocacy support to Palestinian political prisoners in Israeli and Palestinian prisons. This tour comes at a crucial moment: More than 4,900 Palestinians are detained by Israel, including 236 children, 14 elected members of the Palestinian Legislative Council and 170 administrative detainees held without charge or trial. Since 1967 more than 52 prisoners have died from medical neglect and 73 from torture during interrogation, most recently 64 year old Maysara Abu Hamdiyeh who was denied cancer treatment. Since 2011 Palestinian political prisoners are continuously on hunger strike to protest their arbitrary arrest and detention, including Ayman Abu Daoud, who has been on hunger strike for over 3 weeks. Meanwhile in the United States, 166 prisoners are still detained in Guantanamo Bay, many of them on hunger strike to protest their extrajudicial incarceration, especially those who have served years without being charged. African-American children in Cook County, Illinois make up 71% of youth arrests despite only being 32% of the total population. At Pelican Bay Maximum Security Prison in California, mass hunger strikes regularly erupt in protest of the inhumane conditions. Addameer also recently launched a global campaign against adminitrative detention: http://stopadcampaign.com/.